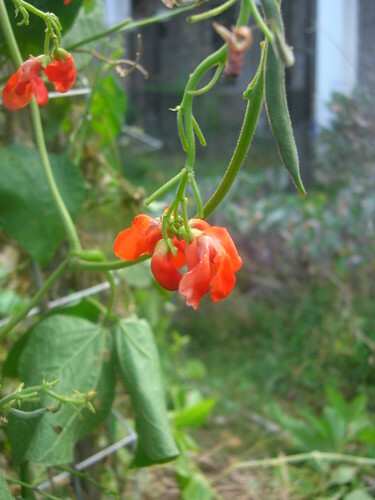 Scarlett Runner Bean from My Garden. Check out my Garden Video Below. I love my backyard garden and treat all my plants as my children. (My kids think I love my garden more than them.) My four kids are now men children, and don’t need that day to day tear wiping, codling, or cuddling that they did when they were younger. I miss those days and have thrown that sense of nurturing into my plants. I would love to hear from you why you garden. Has your plants just become an extension of your family? Or are you a foodie and love picking right from the vine? Has gardening become a family adventure where you garden with your kids? Do you just love the outdoors? But What does My Backyard Garden Give Me? In return, my piece of Eden gives me a sanctuary of peace. A place of decompression. Pulling weeds helps my mind to wander. Almost like meditation. Watching the bees dance around the plants is downright poetic. Helping a plant grow and prosper especially ones that you grew from seed gives me a sense of joy that I can’t explain. I want to inspire all of you to get out that shovel or start thinking about creating your own backyard gardens. Anna, whoa. You are getting all philosophical on us. Someone hose our green girl down. I know. I am getting a little “woo woo” for some of you but I guess it is no different than enjoying needlepoint, working on an old car, or any other hobby that you have. Show of hands. Can you relate? For all of you who are thinking of creating a backyard garden or already love to garden, here is a little glimpse of my Garden of Eden via the above video. I actually did three short video, which I will pepper around the site in the coming weeks. Why three videos? I have diarrhea of the mouth when it comes to my little piece of heaven. I want to share every little plant, weed, and piece of straw. (Not really, but pretty darn close.) Trust me. I know you all love me but a thirty minute tour of my backyard garden would overwhelm the most obsessed gardener. Ask my friends, how obsessed I am about my garden. An intervention has been suggested on many occasions. They just put up with me as I go on and on about what I grow. Each year I look to grow the oddest plants just to see if I can grow them. This is year was sorghum, buckwheat, and artichokes. Not one talks back to me. No one whines at me. No one demands anything of me. I am wrapped up in that beautiful silence with the humming of bees in the background. A backyard garden can be so rewarding even if you have just a small patch. You don’t need to go overboard like I do. Some love flowers. Others like vegetable. Me. Love them both. In the past, we have talked about the million miles your food travels to get to your plate. Or if you love flowers, how many flowers that you buy are not fair trade and may be sprayed with pesticides. Plus, if you love to cook? There is nothing like plucking veggies from the garden and using it right away. Immense satisfaction. Just Got Here and Want to Know the Do’s and Don’t? What is your hesitation about gardening? If you not into gardening. That’s okay. I still love you. If Gardening is not your hobby, what do you do to stay sane? Send me some pictures of your garden so I can post them on the site or join the Green Talk Ning to post your own pictures and videos. my garden is where i grow my tomatoes and other veggies. it’s not big but it’s always clean and it’s keeping me happy.. I know just how you feel about the garden. My yard is where I go to decompress. I live in a desert where almost everyone puts plastic over their whole yard, puts rocks on top of that, and then randomly adds a few trees and cactus back in. It always feels so dead to me that way, but we couldn’t find a house without it. I’ve been working for a few years now to slowly take away the rock in our yard and make it alive again. Native seeds, seeds the birds or the wind are dropping in on us, that sort of thing. Seeing new plants sprout up and watching them mature until I see what they are just completely makes my day. I tend to leave all the weeds alone until they get a certain height, and it always feels like a bit of a treasure hunt when I go out to see what has grown. Wild grass turns out to have a climbing vine flower that uses it for support and shade. A bundle of tumbleweeds are hiding a huge swath of purple flowers. The small bush growing in the shade ended up being a local wild chile plant. I love it. It’s been really wonderful. Even better during all this has been discovering how many of my local plants that are moving back into my yard are actually edible. A native amaranth, wild gourds, legumes, even wild ground cherries. I found out that there are edible parts on almost every tree, cactus, and shrub in my yard, and what isn’t edible is frequently medicinal (like an aloe vera that is growing out back). This one of the most wonderful comments I have gotten on the blog. I would love to see your garden. Do you have a post on your blog I could link to? If it’s the same plant, you might be interested in a little factoid about it. The leaves/stem/flowers, fresh or dried and used in a poultice on the skin, are actually a mild contact anaesthetic. You can’t use too much – like take a bath in the stuff – but it’s really nice used on things like headaches or muscle aches. I would really like to see a whole video on the sorghum from planting to getting something useful from the plant if you could manage a video that has several small bits put together. It would be really cool to see. Do you use the buckwheat? There is a very cool youtube video of a man in England with a small community lot gardening plot who plants wheat…its called something like “From grain to loaf” and he takes you from the initial planting all the way through making a loaf of bread. It is brilliant! and its a surprisingly small lot he uses maybe 30 ft by 20 ft and it gives him enough flour for 8 months of the year making a loaf of bread every week…not bad! can I post his video…well let me know if its alright Anna and I’ll try to search it out for everyone. It’s a delight to watch for anyone wanting and putting forth effort toward getting back to a simpler way of life.